WELCOME TO SANDHILLS ROLL OFF ! If you need a Dumpster Rental for your construction site to get rid of the trash and debris, you have come to the right place. 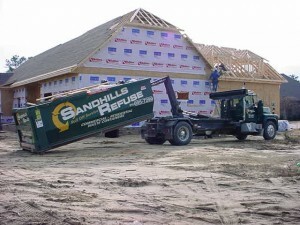 Sandhills Roll Off in Southern Pines is the fastest and most dependable dumpster rental service serving the Aberdeen, Southern Pines, Whispering Pines and Pinehurst Areas in minutes since we are based right downtown! We also offer Porta-Jons for all job sites. From Department stores to messy tenants and remodeling. Sandhills can send a team of professionals with the right equipment to your site for a fast and complete clean out. We make the entire rental process simple for you. With Flat rates and weekend specials, we have the best plan for your job. Just give us a call and our efficient staff will deliver the dumpster right to your site. The courteous and friendly team at Sandhills Roll Off is always on time. Our up-front, transparent pricing ensures that you will never be overcharged. Sandhills Tree Experts is a full service tree care company headed by Mike Palladino, a master technician. For the last 20 years we have offered consistently high quality and reliable service throughout the Central Carolina area. Contact Mike at 910-638-8733 for your tree removal needs. We specialize in dangerous tree removal, trimming, planting and grading. We have all the equipment needed for your special situation. Give us a call today!